Clarets boss Sean Dyche feels his side are showing signs of gelling together. Burnley have won their last two home games 4-0, against Charlton Athletic and Bristol City – although they are their only two wins in their last nine games. But Dyche’s side are slap-bang in the promotion race in fifth place ahead of the home game with sixth place Ipswich tomorrow. And he is encouraged by what he is seeing: “There’s a lot of good things going on here – sometimes they get masked by having a bumpy ride, that doesn’t stop the work we are doing, it just adds to the feel of it when you win. “The last two home games, we have been outstanding. “We’ve certainly laid down good markers at home. 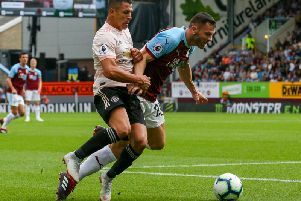 “We’ve played some tough away games, they’ve got to come back to Turf Moor, and we are showing good signs of growing into a very strong unit, and we have done for a while. “It’s my job to look through results and the noise outside, focus on what the group are doing, and I think they’re going along really well.